Owner is off on his new yacht and doesn't want to own Evelyn any longer. West Florida Yachts would love to guide you through a personal showing of this 102' Maiora Motor Yacht 2001. 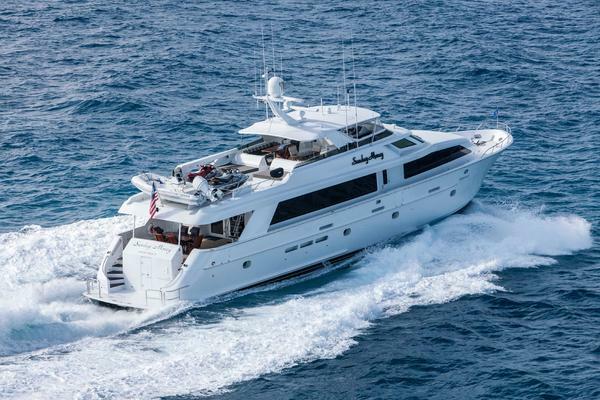 This yacht for sale is located in Palm Beach, Florida and priced at $1,500,000. For a showing please contact us by filling out the form on this page and we will get back to you shortly! Owner & Guests: Sleeps 9 in four staterooms on lower deck; access through staircase from the main foyer amidships (starboard). Bathrooms: 4 owners and guests plus day head on deck and 2 crew's bathrooms. Jacuzzi with separate marble shower for master; stall showers for other bathrooms (day head excluded); ceramic sinks, Microphor heads; mirrors; cabinets; accessories; portholes; exhaust fans. Marble in all floors and counters; lacquered wood or laminate on ceilings and walls. The salon has electrically operated glass door from the aft deck and features two curved coffee tables with symmetrically styled large plush sofas. There is a curved bar amidships forward, with marble surface. The wet bar has icemaker, stainless steel circular sink and ample storage. Behind and above the bar is a 42' Plasma TV. The entertainment system is comprised of a VCR, DVD and CD players, satellite TV receiver and complete surround system. Proceeding forward from the salon there are two electric glass doors. The starboard door leads to the main foyer with the day head and the staircase to the cabins while the port door leads to the formal dining room. The dining room has a large table for eight, chairs, cabinets with drawers for cutlery storage, a set of china and glassware for 12. The dining has a sliding door forward to the galley's companionway and an electric glass door aft leading to the salon. Also includes built in 21" TV and AM/FM stereo radio/CD. The Galley is located forward of the wheelhouse with access to the dining room, side deck and crew accommodation, the galley has a 4-burner electric Gaggenau ceramic cook top, Gaggenau convection oven, Whirlpool microwave oven, double door Sub-zero refrigerator/freezer, Miele dishwasher, granite counter tops, two stainless steel sinks and cabinetry with storage. The crew's dining area is on the starboard side of the galley, composed of a table and seating for four. There is also a flat screen TV with satellite receiver and a radio/CD player, and closed circuit TV monitor. The galley has a pantograph door with access to the port side deck. The Master Stateroom is located amidships with king size bed, two night stands, a chest of drawers, writing desk and vanity table, sofa, safe, spring mattress with pillows, bedspread, halogen ceiling lighting, accent lighting (at sides and at the base of the bed), TV with satellite receiver, multi-system VHS, radio/stereo with CD player. Accessible from the cabin is a walk-in closet with wardrobe, drawers and shelving. The fully marbled bathroom has a Jacuzzi bath, two ceramic washbasins, toilet, cabinets, mirror, electrical exhaust fan, accessories and stall shower. The VIP Stateroom is located forward with a king size bed, spring mattress and pillows, bedspread, two nightstands, wardrobes, a chest of drawers, mattress and pillows, halogen ceiling lights, accent lighting. There is also a TV with satellite receiver, multi-system VHS, stereo with CD player. The bathroom has cabinets, mirror, ceramic wash basin, toilet, electrical exhaust fan, accessories and a stall shower. This Guest Stateroom starboard side has a full size berth and object holders placed on the wall beside, nightstand, wardrobe, drawers, mirror, mattresses and pillows, bedspreads, halogen ceiling lights, accent lighting, TV with satellite receiver, multi-system VHS, radio/stereo with CD player, halogen lights. The adjacent bathroom has cabinets, mirror, ceramic washbasin, toilet, electrical exhaust fan, accessories and a stall shower. This Guest Stateroom is port side and two twins with pullman and object holders placed on the wall beside, nightstand, wardrobe, drawers, mirror, mattresses and pillows, bedspreads, halogen ceiling lights, accent lighting, TV with satellite receiver, multi-system VHS, radio/stereo with CD player, halogen lights. The adjacent bathroom has cabinets, mirror, ceramic washbasin, toilet, electrical exhaust fan, accessories and a stall shower. Polished aluminum full coverage standard Sun Cover with moveable Sun Roof and LED lights! Riviera magnetic compass White Star 5"
The Crew Quarters have three separate rooms and a Captain's cabin with ensuite bathroom, single bed, closet, dresser, safe, night table and reading lamp; a crew cabin with two beds, closet, drawers and reading lamps and a third cabin with a double bed. The latter two share a large bathroom with cabinet, mirror, washbasin, toilet, electrical exhaust fan, and a stall shower. All three cabins have their own flat screen TV with satellite receiver and a radio/CD player. Finish is the same as the rest of the yacht. Wet bar in salon with ice maker; extra freezer and refrigerator below raised pilot house; (2) washers and dryers; Gaggenau barbeque, refrigerator, sink, and ice maker on flying bridge; central vacuum system. Furniture and all bulkheads in lacquered wood, gloss or satin. Floors and tops of galley and bathrooms are covered with marble or granite as well as the tops of the bars and some floor sections particularly subject to traffic. Located in the aft area of the boat, it features the MTU main engines with V-drive gear boxes, two generators, main electrical switchboard, engine and service batteries, all air conditioning machinery. The Lazarette is aft of the engine room and accessible directly from the platform through a hydraulic door or from the engine room, which has an access from main deck through a waterproof door and ladder. The garage can contain the cable master, the emergency steering wheel, the Atlas converter and can contain a small jet ski or a motorcycle or can be used as a gym. Presently, the garage contains the Atlas system, shore cords, eight step boarding stair, boarding ladder and swim ladder. 3000 hour service completed recently.